Today is the 100th birthday of the great influential thinker Marshall McLuhan. McLuhan died back in 1980 but his influence has exploded over the last decade or so as most of what he used to talk about in the 1960s has come to fruition lately. I spoke about this in two recent posts reviewing Douglas Coupland's excellent new biography of McLuhan. 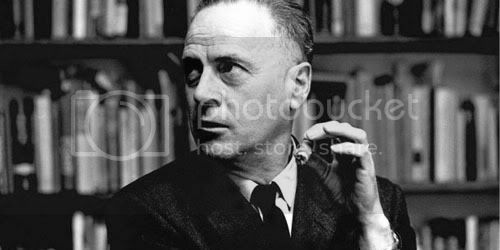 Ever since reading that book, I've been devouring all the McLuhan material I can find albeit without picking up any of his books yet (I'm already far behind on a bunch of other books). I can't quite pinpoint what it is exactly that so fascinates me about McLuhan but his intense erudition and his nonchalant, almost humorous way of presenting it certainly appeals to me. He was also a devout student of Joyce, especially Finnegans Wake and he often brings up the Wake in his writings, lectures, interviews, etc. He was also a sort of modern public mystic, one with the physical appearance of a 50-something-year-old English professor (which is exactly what he was). For someone who was technically a literary scholar writing books about the future of technology, he was also very much a poet, an artist. There is an audio clip of an interview with Robert Anton Wilson that I often listen to where he discusses Finnegans Wake at length and in the opening he describes James Joyce as "one of the greatest archeologists who ever lived." The more I look into McLuhan, the more that quote resonates in my mind and I've been starting to see McLuhan as a sort of successor to Joyce in that respect, a perfect connecting link between Joyce (who flourished in the first three decades of the 20th century) and the current times. I need not try to expand on all of that here as the 100th anniversary of his birth (his birthday is actually just three days after mine, I turned 26 on Monday) has brought about a whole slew of interesting pieces and profiles all over the interwebs. That last part brings to mind a quote from Wyndham Lewis that I recently came across (no surprise since McLuhan was buddies with Lewis for a while): "The artist is always engaged in writing a detailed history of the future because he is the only person aware of the nature of the present." The Toronto Star also has a couple of pieces about him. Douglas Coupland, author of the aforementioned book You Know Nothing of My Work!, wrote a piece on MM in the Guardian. The American Spectator has an interesting piece talking about McLuhan and Mark Zuckerberg. And, of all the McLuhan pieces I've read today, the best one is this blog post by Nicholas Carr. I think I've already linked to this before but here is a great article about McLuhan and Giordano Bruno. Thanks for taking the time to post all this.